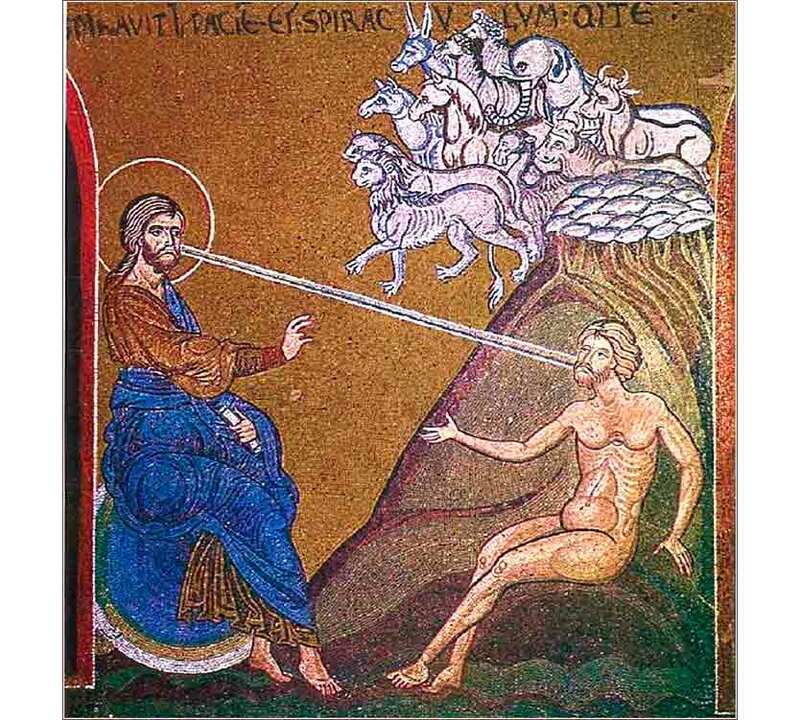 Creation of Adam, mosaic in Monreale Cathedral, Sicily, ca. 1180. There is something so wonderful about the simplicity and innocence of this hymn: My Jesus I Love Thee, sung by the Charity Homeschool Chorus. What New Testament verse indicates that the Bible is the Word of God. 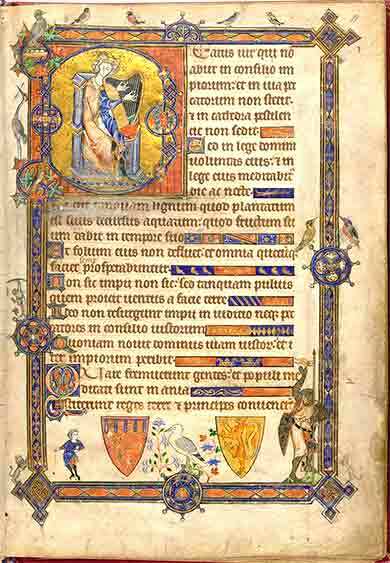 Psalm 1 from the Alphono Psalter, English ca. 1284. Notice David with his harp, rendered inside the initial “B” (Beatus vir qui non abiit in consilio impiorum — “Blessed is he who walks not in the counsel of the impious.” We also see young David at bottom left with his sling, preparing to meet Goliath (on the right). But as for you, continue in what you have learned and have firmly believed, knowing from whom you learned it and how from childhood you have been acquainted with the sacred writings, which are able to make you wise for salvation through faith in Christ Jesus. All Scripture is breathed out by God and profitable for teaching, for reproof, for correction, and for training in righteousness, that the servant of God may be competent, equipped for every good work. 3. What is not written in the Bible is not the Word of God. he first rule is the most basic. Christianity is a discipline of obedience to God's word. Once a person decides that they will believe or follow this part of the Bible but not that part, they have broken the discipline, and replaced the Word of God with words created in their own mind. They do not worship the God who said, “I am.” For the original and only source of our knowledge of God is the Bible; and if it is not inerrant, then any part might be erroneous. To breech the integrity of the Bible and accept less than its entirety is to worship a manmade god. It is a decision to worship what one sees in the mirror as a greater authority than the inspired Word. To clarify terms, the word “inspired” is very narrow and specific in Christian dialogue. It means, actually, the exact same thing as “breathed by God” (compare “respiration”) and refers to men who wrote a book under God's direct hand. “Breathed” was a Hebrew idiom for “spoken”, the idea being that the very breath responsible for a spoken word was from the “lungs” of God — only God uses spirit, not lungs, to speak. Do not confuse it with the common use of “inspired”, which has broadened over the years to mean any brilliant and intuitive action. The quote from 2 Timothy is critical to understanding Christianity, for it self-validates the Bible. One may disagree with it (and many people do), but then the Bible becomes just another book. Paul tells us, though, that we must take it all or take none of it. For it is only by the Bible that we know anything of Christ; and if the Bible is not inspired, we lose Christ. The doctrine of Biblical inspiration is separate from arguments over literalism; inspiration tells us that the Bible is truth, from start to end. But the Bible is a book of supernatural truth, not scientific or historical truth. One might believe, for example, that the length of the “day” in which God created various parts of the universe means something different than the 24-hour period of the earth's current rotation, without affecting the truth of Genesis 1. There are myriad and complex doctrines, all with five-dollar words attached, about how one might interpret the Bible; but getting bogged down in them is a distraction from our life in Christ. I had intended to talk about Rule 3, actually, but we are out of room and have not even finished with Rule 1. We will continue this on our next free dayDaily Prayer takes a break from studying a specific book — currently Matthew — on Wednesday and Sunday., Sunday.